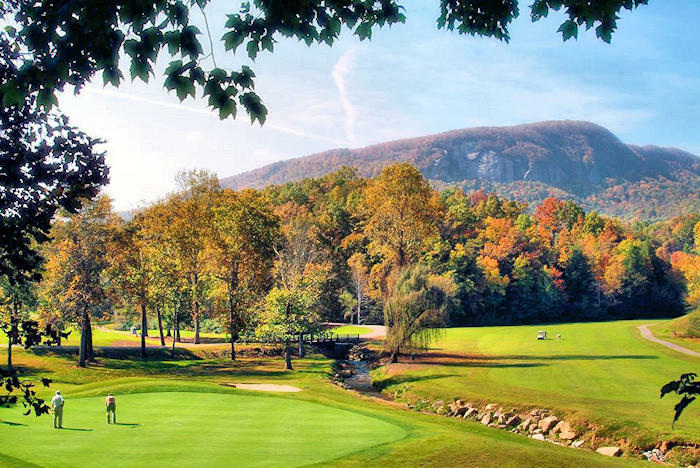 The Blue Ridge and Smoky Mountains of Western North Carolina that surround Asheville are well-known for their many fly fishing streams and creeks with diverse stream conditions, from tiny, plunge-pool headwater streams to broad, open-valley rivers. 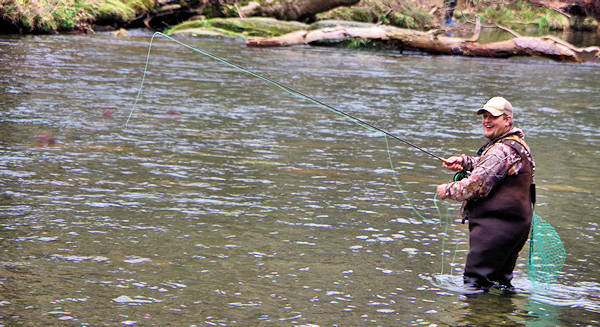 The Nantahala and Pisgah National Forests are the first targets for quick access to wild, pristine trout fishing. Whether you're searching for Rainbow, Brown or Brook Trout, you'll find that these scenic waters boast some of the best fishing around. Small and Large Mouth Bass, Crappie, Sunfish and more can also be found in abundance in the region. Book a fly fishing trip with a local guide - no experience is necessary and equipment is provided. 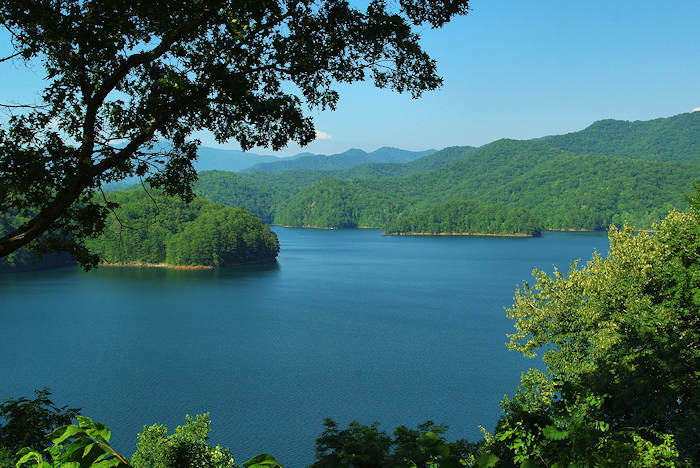 Discover one of the most diverse fishing habitats in the world with four rivers and dozens of mountain streams throughout the Great Smoky Mountains, and the deep, cold waters of Fontana Lake. You can even fish the Tuck in downtown Bryson City. Greatly enhance your chances of catching trophy fish by hiring a professional fishing guide. Find 26 best fishing spots and guide services. Welcome to the first fly fishing trail in the United States with the best 15 spots for catching brook, brown and rainbow trout. With 92,800 fish stocked in its waters annually, Jackson County was named North Carolina Trout Capital. See detailed maps and fishing reports. Through exhibits and videos, learn about past fly fishing legends, the evolution of rods and reels, basic knots, fly-tying, types of gear, types of gamefish, regional fishing waters and the history of fly fishing in the Southeast. Open Mon-Sat, 9 AM-6 PM. Free admission. 210 Main Street (Chamber of Commerce) in Bryson City. Guided fly fishing float trips on the French Broad River in the Asheville area are much fun for both first-time and experienced anglers visiting the North Carolina mountains. All you have to do is show up! Southern Appalachian Anglers supplies a specially designed drift boat, all your equipment and a friendly guide that knows all the great fishing spots. Take a half or full-day trip. Their guides specialize in smallmouth bass and trophy trout fishing. Looking for the thrill of landing bigger fish? 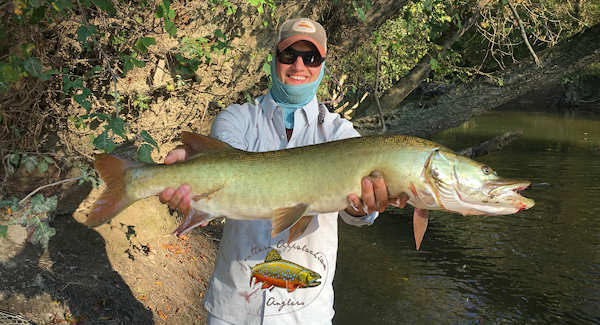 They also offer some of the best trophy musky (muskellunge) fishing trips in the southeast. March through May and September through April are generally the best months for larger sized fish, with the summer months being great for quantities. For more info and to book a trip, go to their Web site. Lake Julian, located in South Asheville, is well stocked with bass and bream. Canoes and picnicking are available. Lake Julian has an abundance of bass, catfish, brim, tilapia and crappie. Because Lake Julian is a "thermal" lake (the lake is used as a cooling agent for CP&L), some of the best fishing occurs from October through March. No boats are available, however. From Asheville, take 26 East and take Exit #37 - turn left on to Long Shoals Road and travel 1.1-mile - turn right on to Overlook Road and travel .1-mile - see the park entrance on the left. Lake Lure, on U.S. 74 about 40 minutes southeast of Asheville, has trout, bass, bream and watersports; motorboats are available. Lake Glenville is located near Cashiers. The Davidson River area is located in Pisgah National Forest, near Brevard. The area is easily accessible by car. Rivers and streams within the Davidson River area support a variety of fishing opportunities including backcountry trout fishing on Cove Creek, more accessible stream fishing on Avery and Looking Glass Creeks, and trophy brown and rainbow trout fishing on the Davidson River proper. From Asheville, follow Interstate 26 East to exit 40 (Asheville Regional Airport). Go south on Highway 280, and follow to intersection with Highway 276. Turn right onto Highway 276. This road follows the Davidson River upstream to the intersection with FS 475. Look for signs to the Pisgah Forest Fish Hatchery. 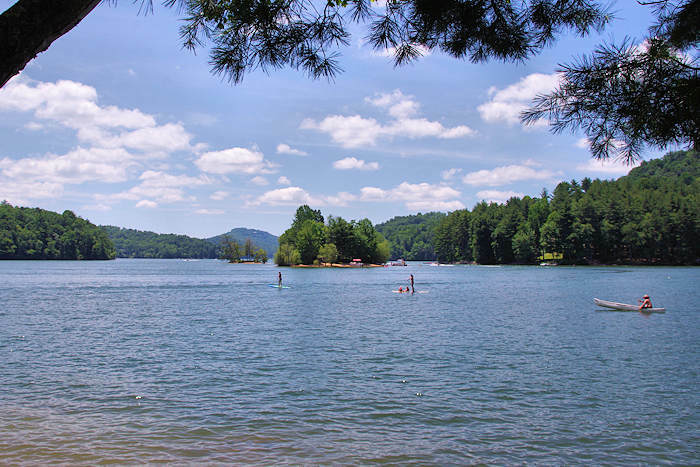 Lake Powhatan in the Pisgah National Forest is a small lake near Asheville with a sand beach, fishing, swimming and camping. The lower French Broad River area supports a variety of fishing opportunities including large river fishing from bank or boat, and smaller river and stream fishing. Head to Madison County, home of Hot Springs and the Appalachian Trail, easily accessible by car. From Asheville, follow Highway 19/23 North to Marshall, and exit right onto Highway 25/70. Follow Highway 25/70 to Hot Springs. To access the lower French Broad River proper, turn right onto SR 1304 and follow to the Murray Branch Recreation Area. To access Spring Creek, follow Highway 25/70 through Hot Springs and turn left onto Highway 209. Follow Highway 209 to the Rocky Bluff Campground on your left. Newberry Creek is managed under the NCWRC's Catch and Release, Artificial Lures Only regulations. This high-gradient stream is among the most pristine on the Pisgah National Forest. Deep pools and steep, but small falls, make chest-waders a must. The surrounding landscape is wild and beautiful. FS 482A follows the creek for a while, making foot access easy. From Interstate 40, take Exit 72 (Old Fort). Follow Highway 70 to the intersection of SR 1227. Turn left onto SR 1227 and follow to FS 482 (same road). FS 482 follows Curtis Creek to the Blue Ridge Parkway near milepost 344 and Highway 80. From SR 1227, where it turns to FS 482, turn left onto FS 482A and follow to a small parking area at the end of the road to access Newberry Creek. 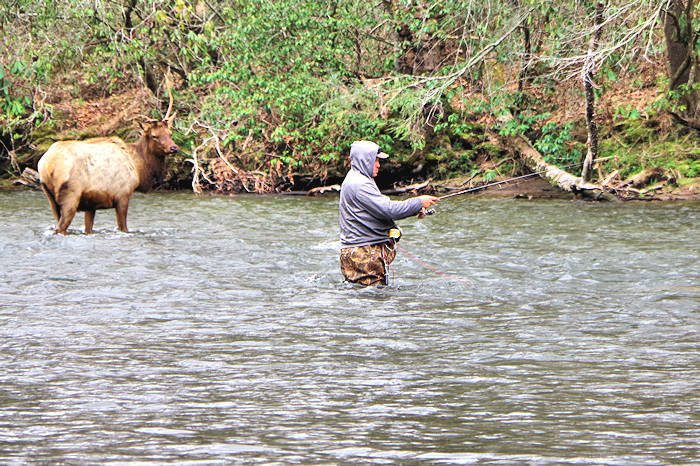 Featuring excellent trout fishing, North Mills River is easily accessible from Asheville. The area also offers some excellent backcountry Trout fishing on Big Creek and Fletcher Creek. Take I-26 East out of Asheville to Exit 40, NC Highway 280 South, and follow the signs to North Mills Recreation Area. Both the Upper and Lower Nantahala are gold medal trout streams, and NOC offers guided fly fishing trips near Asheville on the Nantahala and to the rest of the Smokies' classic trout streams. Cherokee has 30 miles of rivers and creeks stocked by largest trout fishery in the eastern USA. The permits required for trout fishing in North Carolina do not cover fishing in Cherokee. You must purchase an Eastern Band Sport Fishing License from the Cherokee tribe. This license gives you trout fishing access to all the ponds and streams open to the general public on lands owned by the Eastern Band of Cherokee Indians. You may catch up to ten trout per day, per permit. Buy your $10 permit online or from one of many stores in Cherokee. NC Fishing License: Purchase online. Residents of North Carolina should select the Comprehensive License option, a $20 license which includes the necessary Trout Stamp and is good for 12 months from the date of purchase. Non-residents--a license including the Trout Stamp is $20 for one day, $25 for three days, and $40 for the annual license. More info: NC Wildlife Resources website.